It seems that summer - specifically the July 4th holiday weekend - brings beer reviews, as it did last year. Visiting family in Ocean City, MD, my transpeninsular two-steppimg has taken me to a few of the breweries I'm the area, and my most recent trip took me to Delmar's 3rd Wave Brewing Company. I'll spare you my romanticization of a city that straddles the Transpeninsular Line and stick with the trip to 3rd Wave with my mother-in-law. 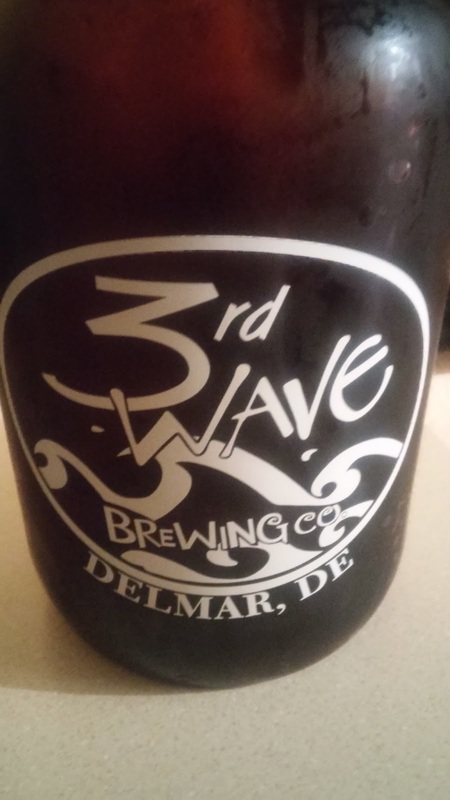 I had looked up Delaware breweries and came across 3rd Wave, which is reasonably new to the landscape. I made plans to head out that way and sample their wares. A quick note on my drinking habits: I'm a habitual trier. My stomping ground is that of the flight, of the seasonal sampler, of the never-order-the-same-beer-twice. Put another way: I have commitment issues. My sister-in-law got me a growler for Christmas a year and a half ago that has yet to be used, not because I don't love beer, but because a growler is quite the commitment. Then I met 3rd Wave's Sour Lime Saison. I entered with my usual MO: I got a four beer flight, which yielded a no-thanks, a couple of alrights, and, in the Sour Lime, an I'd-like-to-get-to-know-you-better. I got a pint of a fifth brew entirely, but when my mother-in-law offered a gift, I went all in and got a growler of the Sour Lime. I have since finished said growler (not in one sitting, but it was a thought) and am trying to figure out how best to get back to Delmar for another fill. Its taste? It's what Bud Light Lime should aspire to when it grows up. Believe it or not, that's high praise. Bud Light Lime is what I've dubbed a white shoe beverage - it's only appropriate between about Easter and Labor Day. And while "Macro We Stand" is the most to-hell-with-the-little-guy (and thus, American?) slogan ever, I'm not too much of a beer snob to kick it with an enjoyable major label beer. The Sour Lime might just be the perfect summer brew, but unlike the Bud Light Lime, I'd gladly enjoy this anytime. If you find yourself in the environs of the Delmarva peninsula and the opportunity presents itself, head to 3rd Wave and treat yourself.